Bennie “Zip” Young Kyoshi/Shihan is the founder of the University of Martial Arts and Sciences Goju Ryu System. Kyoshi has over 43 years of martial arts experience, 30 years in various Goju Ryu systems. Kyoshi has been a student of some the pioneers of Goju Ryu. Maestro Robert “Jock” Taylor (Goju Tai-Jitsu). Ron VanClief Shidoshi (Chinese Goju). The late Frank Ruiz Grandmaster (Nisei Goju). The late Peter Urban Grandmaster (USA Goju). The late M. Terry Hayford Shihan (Dai Gakko No Bujitsu Kai). Samuel Bell Shihan (Mixed Martial Arts). Young Kyoshi is currently a member of and advisor to the Aiki Kan Preservation Society and advisor to the Kari No Michi Ryu under the direction of Carey Rossignol Hanshi Shodai. As well as a member and advisor to the International Ryu Kyu Kai Karate Association, under the direction of Dr. Robert Handley Hanshi. (Zip) Hanshi, is the founder of the University of Martial Arts and Sciences Goju Ryu System. Hanshi has over 44 years of martial arts experience, 30 years in various Goju Ryu systems. Within the last 14 years Hanshi has studied with the late M. Terry Hayford Shihan (Dai Gakko No Bujitsu Kai) & Samuel Bell Shihan (Mixed Martial Arts). Young Hanshi is currently a member of and advisor to the Aiki Kan Preservation Society and advisor to the Kari No Michi Ryu under the direction of Carey Rossignol Hanshi Shodai. As well as a member and advisor to the International Ryu Kyu Kai Karate Association, under the direction of Dr. Robert Handley Hanshi. Hanshi, 9th Dan/Founder, University of Martial Arts and Sciences Goju Ryu System. Delaware Representative, Karate-jitsu, Dai Gakko No Bujitsu Kai. Advisor, Aiki Kan Preservation Society. 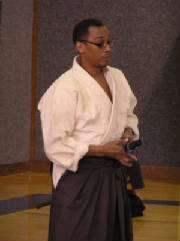 Sou Dan Yako, Advisor, Kari No Michi Ryu.